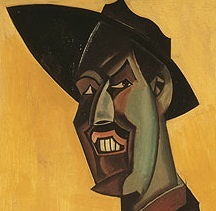 The Lewisletter (LL), edited by Robert Murray, is the mouthpiece of the Wyndham Lewis Society and the companion publication to The Journal of Wyndham Lewis Studies. Appearing annually, the Lewisletter informs Society members about matters concerning Lewis and the increasing interest in his work. It attempts to provide a continuing record of publications and media references relevant to him, and to publish newly discovered and previously unseen pictures and texts. Society members receive a copy of the Lewisletter as part of their annual subscription package.